The post-war and contemporary art day sales in London last week raised a total of £31,974,700 (excluding buyer’s premium), against a pre-sale estimate of £28,130,600 to £39,804,500. The result from Christie’s, Sotheby’s and Phillips was 57% higher than October 2016. 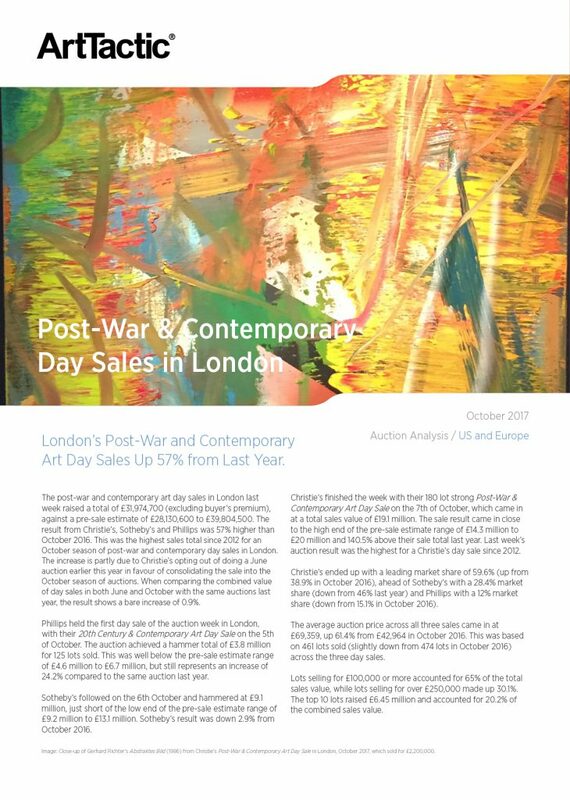 This was the highest sales total since 2012 for an October season of post-war and contemporary day sales in London. The increase is partly due to Christie’s opting out of doing a June auction earlier this year in favour of consolidating the sale into the October season of auctions. When comparing the combined value of day sales in both June and October with the same auctions last year, the result shows a bare increase of 0.9%. Phillips held the first day sale of the auction week in London, with their 20th Century & Contemporary Art Day Sale on the 5th of October. The auction achieved a hammer total of £3.8 million for 125 lots sold. This was well below the pre-sale estimate range of £4.6 million to £6.7 million, but still represents an increase of 24.2% compared to the same auction last year. Sotheby’s followed on the 6th October and hammered at £9.1 million, just short of the low end of the pre-sale estimate range of £9.2 million to £13.1 million. Sotheby’s result was down 2.9% from October 2016. Christie’s finished the week with their 180 lot strong Post-War & Contemporary Art Day Sale on the 7th of October, which came in at a total sales value of £19.1 million. The sale result came in close to the high end of the pre-sale estimate range of £14.3 million to £20 million and 140.5% above their sale total last year. Last week’s auction result was the highest for a Christie’s day sale since 2012. COMPARATIVE PERFORMANCE (SOTHEBY’S, CHRISTIE’S AND PHILLIPS). London’s Post-War and Contemporary Art Day Sales In October Were Up 57% from Last Year.